This was to be our make-up float for the August 13 float that got postponed, but, alas, Mother Nature has other plans. We will keep a close eye on the weather and make a decision by Friday at 2pm. We will e-blast and post on FaceBook and our website Blog…or you can call Joe Kendall at 512-289-0750. We have great appreciation for this lovely, refreshing rain, but we’ll hope for a bit of a break so we can all float on Saturday, August 20. EXCITING NEWS FOR TEXAS RIVER SCHOOL! We have good reason to be excited! Several wonderful things took place at our July 19 Board Meeting that we want to share. Executive Director and Founder, Joe Kendall, announced that he plans to semi-retire in the next three years. The process of turning over operations of the foundation to the next generation of river lovers has begun. Anna Castillo, Office/River School Manager who has been with TRS for the last three years, was promoted to Assistant Executive Director of The Chautauqua Foundation, Inc., and Amber Davis, TRS Trip Leader for the past two years, was promoted to Director of the River School. Congratulations Anna and Amber, the A-Team! We are also VERY excited to announce the addition of two new members to our Board of Directors, Brandon Cox and Kathleen Davies. Brandon Cox first discovered Texas River School through his participation in Amplify Austin (he’s the one who won the kayak auctioned off at our Amplify Austin Party this past spring). Brandon spent quite a bit of time on Texas Rivers as a child and quickly connected with the TRS mission. Brandon moved to Austin in 1998 after graduating from Texas Tech University with a degree in Family Financial Planning, and has worked in the financial services industry ever since. He is co-founder of Cox & Kor Wealth Management, independent financial advisors, and has been an active participant in Austin’s non-profit community through contributions, volunteer work and board membership. Brandon also enjoys collecting antique and rare books, the performing arts, and participating in cooking competitions (he’s done chili cook-offs and a couple of goat cook-offs). Welcome Brandon! Kathleen Davies has been a long-time friend of the River School, even back when it was in its incubation stages, but was unable to get more involved at the time. She did, however, manage to get TRS a $2,000 donation from the Elks a few years back then surprised us again at the July 19 meeting with another check from The High Road on Dawson Charity (story below). Kathleen is currently employed with Texas Education Agency in their Educator Investigations Division, part of a career that has spanned over 25 years with enforcement in Texas, protecting children and citizens. Welcome Kathleen! 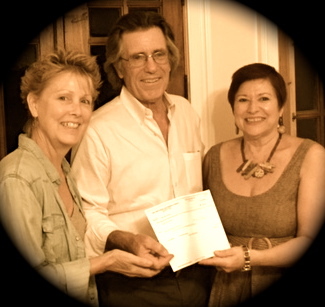 Referred to above, Kathleen Davies presented Executive Director Joe Kendall and Board President Linda Overton-Kendall with a $3,500 check from The High Road on Dawson Charity. This gift was totally unexpected, and we are so very grateful to High Road Charity for their generous contribution!!! Kathleen Davies presenting check from High Road Charities. What a great way to spend a warm summer evening…on the river with good friends and good music. Join us this Saturday, August 13, for our next Moonlight Bat Float and musical guest Out of the Blue! Arrive early for a 6:30pm check-in at the docks of Texas Rowing Center (1541 W. Cesar Chavez St., 78703). Music and paddling – what a great combination! Purchase your tickets NOW! Mark your calendars for our next Moonlight Bat Float on Saturday, August 13! Arrive early for a 6:30pm check-in at the docks of Texas Rowing Center (1541 W. Cesar Chavez St., 78703) then paddle downriver with the TRS group to Congress Street Bridge and watch the bats emerge. Music and paddling is a great combination! Purchase your tickets online NOW!